152 mm/50 Mk66 х 1 pcs. 120 mm/50 Mk34 х 1 pcs. Initial HE Shell Velocity675 m./s. 37 mm Maxim4 х 1 pcs. 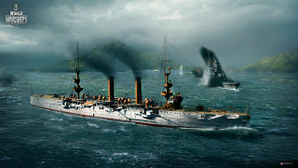 Albany — American promo premium Tier II cruiser. The ship was built in the U.K. for the Brazilian Navy, but was purchased by the U.S. Government. When commissioned, Albany was the most successful cruiser in the U.S. Navy. Despite relatively small dimensions, she carried powerful armament. Albany was a Tier II Premium ship during the Closed Beta Test and was a special gift ship for Wargaming's 17th Anniversary. Albany has sub-par gun range, but that doesn't prevent it from being able to stand its ground when used well. Specifically, it is quite maneuverable and is best suited to a play style resembling that of American destroyers; that is, going around island in a bid to remain in cover and strike at the enemy while he doesn't expect you. In the hands of a capable captain, this ship remains respectable threat, being able to damage most ships of Tier II and III. Good damage per second out of her main battery. Incredibly tight turning radius of only 350m. Low top speed of only 20 knots. As a premium ship, Albany doesn't have any upgrades to research. As a premium ship, Albany comes included with Type 9 camouflage that lowers her detection radius, reduces the accuracy of incoming shells, and increases the amount of experience she earns. The third USS Albany (later PG-36 and CL-23) was a United States Navy protected cruiser. She saw service in the Philippine–American War and World War I. This page was last modified on 3 May 2018, at 20:10.